Volume 2: What Are Your Plans, Margreet? Volume 3: At Last… Margreet! Volume 4: I Need Your Help, Margreet! Volume 5: One Day at a Time, Margreet! Margreet comes from a plain family, and their simple lifestyle annoys her, often causing conflict. She wants to live higher, like one of her friends. When her best friend Tineke becomes incurably sick and dies in peace, Margreet comes to understand that there is something better to be found – something higher and more important than being rich or famous. “I’m leaving, Mom!” Margreet announced. “Margreet! Your lunch!” Mother called back. Margreet came back into the kitchen. With lunchbox and thermos in hand, she ran out the door and grabbed her bicycle, which stood ready outside with her book bag on the back. There was no time to put the lunch and thermos in her bag, so she would just hold them in her hand. Margreet pedaled as hard as she could down the street, careening dangerously around a corner, and looked ahead of her. Certainly they will wait for me, won’t they? Just imagine... The first day of school, and if they’ve left already, I will have to go all the way to school by myself. There is the street. Ah! The kids are still there, waiting for me. Good! “Who is the last one, again?” teased Peter as Margreet pulled up by the group, huffing and puffing. “Are you awake already?” asked Margreet cheerfully. Meanwhile, Margreet had a chance to put her lunchbox and thermos in her bag. Quickly she slid the book bag under the straps again--there. Ready to go. She rode in the back with Ellie. What a long line! “Hans, are you remembering the little ones?” someone shouted. “Yes, they’re getting initiated,” he replied. The little ones. Margreet had to laugh. They were the three from the ninth grade, who biked along today for the first time. That would not be so easy for them. The first few days the group would have to go a little slower. Last year she was one of those “little ones”. Now she was part of the “group”. I can’t keep this up, I just can’t, she used to think as she rode along, but every day it went better, and she got used to it. See, now the boys are taking their time. They all had to get used to the trip again after their long vacation. It’s good that the weather is pleasant. If you had rain already the first day... then you would lose courage right away. It was not pleasant to bike for half an hour over the long, bare dike in rain and wind. Margreet shrugged her shoulders. She actually did look forward to the new school year. Whatever would I do at home? She liked school, but Ellie didn’t. She knew that was Ellie’s problem. “And with all three of us taking up the whole bicycle path, we’ll likely get a ticket,” grumbled Ellie. Suddenly Margreet shot ahead. Let those two sisters figure it out without me. They were always quarreling. She rode beside Tineke now, the girl she hung around with the most. Tineke was in her class too. “The ferry! Hurry up!” called one of the boys. That shout from the front worked like a stomp on the accelerator. There was no more talking, as silent and tight-lipped they quickened their pace. The freshmen had to follow, like it or not. The ferry... It was still on this side! The boys began to ring their bells, because if the ferryman saw or heard them, he would wait to shove off. He was a kind man, but if he missed them, they would have to wait at least fifteen minutes before he would return from the other side. Huffing and puffing, they rattled down the planks of the little ferryboat. They made it and looked at each other with relief. Now we can take a breather! “Will you still say that after a while, Jansen?” asked Koos cheerfully, and they all laughed, even the ferryman, whose face was covered with brown wrinkles. “All right!” shouted Jan, and they all laughed. They had been mischievous at times. Then the ferryman had said nothing but had silently and effectively punished them. The next day he just pushed off for the other side just as they came riding up. How often does Jansen say “eh” when he tells something? wondered Margreet. It was a real stopgap of his. They all looked at the gently flowing water of the river, having seen it so often before, but it was always beautiful and always changing. The clear blue sky, with an occasional stray white cloud, gave a sparkle to the water swirling around the pilings that stuck straight up along the bank, and little waves broke against the shore, where willow branches bobbed along gently. There was always life on the river. In the distance you could hear the soft chug of an approaching boat. The water rustled along the side of the ferryboat, while a couple of gulls flew over, screaming. With a grinding sound, the ramp of the ferry scraped over the road at the other side. They were there! Noisily they pedaled off the ferry in a long line. “See you this afternoon, Jansen!” they called. “Do your best, kids. See you this afternoon, eh?” Now for the dike yet. There was no wind, so they could make it in twenty minutes. At the school they greeted everyone noisily. The girls from the high school stood in a big circle. “Have you seen Haantje yet?” asked Annemarie DeGeus mysteriously. “He’s wearing a ring!” announced Annemarie as she looked over all the curious faces with a mysterious smile. The impression of this news made the girls silent for a moment. Then came the questions. “You tease!” cried Anke, with a slight shrug. There was no opportunity to pursue the subject further, however. “There’s the VandenBorge girl!” announced Nel suddenly. They all looked in Nel’s direction as a tall girl with blond curls entered the school. “Who is that, Nel?” they asked curiously. “She lives in our town,” informed Nel. “Her father and mother are divorced, but her mother is remarried, so they still live in our village. Betsy went to live with her father in The Hague, but apparently her father is sick, so she returned.” Nel had an attentive audience. “Is she nice?” asked Tineke Verhoog, concerned. “I don’t know,” said Nel frankly. “In elementary school she was a class ahead of me. I think she’s a little conceited.” The bell rang, so there was no more time to exchange all the latest news. It would have to wait until recess. Margreet looked at her schedule to see to what classroom she had to go. She liked it that almost their entire bicycle club was in this class again. Only Marlies was not there, since she would still be in grade nine. Will that new girl who Nel had talked about take her place? “Let’s try to sit together,” whispered Nel, poking her. Margreet nodded. Annemarie and Tineke were already sitting down, and Wilma and Anke were heading for the places behind them, when.... Too late! Two boys with broad grins took possession of those tables. “How rude! Ladies first,” grumbled Wilma. Margreet set her schedule on the bench in front of her. (She would need it many more times before she would be accustomed to her new routine!) It became quiet in the room, and Margreet looked up. Oh! There was Mr. Willems with that new girl. Apparently she will be in this class too. “Boys and girls, a new student is coming unexpectedly into your class. This is Elizabeth VandenBorge. Let’s see if there’s a seat left, Elizabeth.” His eyes searched the room. Diagonally in front of Margreet was an empty chair. “There, sir,” the girl pointed out and walked straight to the empty chair. She isn’t shy, thought Margreet. She looks so grown up, and she has such pretty blond hair! They look like natural curls too. Her clothes are not really school clothes either. Would that be because she has lived in The Hague? On the other hand, it was quite a pitiful story that Nel told about her. “Elizabeth VandenBorge,” Mr. Willems had said. (Nel had called her Betsy.) Will she use her full name? It sounds much nicer. (Margreet had also done that herself.) Margaretha vanEnkhuizen, now, that sounds good! (She was always Mar at home.) The name Mar is horribly common, and homely. As soon as she had come into junior high, she had changed that. 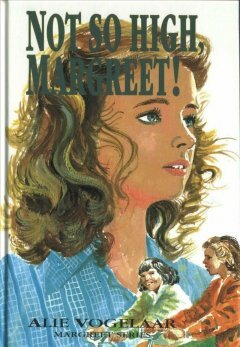 Every time her name was called, she said, “Margaretha.” It was changed to Margreet, of course, but that was still nice. In any case, it was better than Mar, but she didn’t need to bring the subject up at home, for her family considered it to be silly. “Young people, let’s begin,” announced Mr. Willems. All hands were folded, and all heads bowed while Mr. Willems thanked the Lord, in a simple prayer, for His preserving hand, especially during the past vacation, since they were all enabled to return to school in good health. He also asked for help and strength in the new season, and that they might be spared in the new school year from an unexpected and unreconciled death. After the “Amen,” there was a shuffle. “Your books, young people,” requested Mr. Willems. The first day of school had begun. With a sigh, Margreet placed her bicycle back in the shed. The first school day was over. She walked straight through the kitchen to the living room where mother was busy with the laundry. The whole table was filled with piles of clothes, and steam was rising from the ironing board. “Hi, Mom!” called Margreet. “Hello, Mar!” Margreet looked around. What a mess! She flopped down on an empty chair. “There sits our lady,” teased Wim. Wim glanced at his mother, who calmly continued with the ironing. He didn’t go any further with the “touchy” subject. Margreet grabbed the teapot, which was standing ready on a tray on the table. “Will you pour me a cup too, dear sis?” asked Wim. “I will, because you asked so politely!” retorted Margreet. “I know, but there are many things to be done, with five children, and I don’t have a maid.” Margreet could hardly imagine what it would be like to have a maid in the house. No, that would be nothing for Mother! If the work was not done the way she liked, then in the evening she would do everything over! Margreet chuckled, just thinking about it. “What’s so funny?” Wim inquired curiously. “Who is that last one, Mar?” asked Wim smiling. “You tease!” Margreet exclaimed, shrugging her shoulders. Mother laughed and then quickly continued ironing, knowing that if she hurried up, she could be finished just before mealtime. Jan had gone to the farm with his friend, while the two girls, Willie and Rianne (the youngest) played together in the yard. “If you’re going upstairs now, would you take something along?” Mother asked Margreet, who nodded. With her schoolbag in one hand, and a pile of ironing in the other, she cautiously climbed the stairs. She grinned and thought of what would happen if she dropped it. Then Mother would have to iron everything over again. She would not put it in the closet if it were wrinkled. Margreet opened the window in her room as wide as possible. It was still so comfortable outside. She looked around her room with satisfaction. It was small; there was just enough room for a bed and a table with a chair, but she was so glad she had the room all to herself. The two boys slept in the attic, and Willie and Rianne had to share a room. That Elizabeth VandenBorge must have a huge room! Margreet thought. She looks so dignified. She probably has a maid too. Should I try to start a conversation with her tomorrow? She looks so much older! Maybe she wouldn’t appreciate it, but it would not be nice to ignore her either. She has gone through so much, with a mother who is married for the second time and a father who is terribly sick! That was really something! Margreet could not imagine what that would be like. She sympathized with the tall, pretty girl, but deep in her heart she was also terribly curious. Maybe she is from a very dignified family. VandenBorge... hmm... such a name doesn’t really tell you anything. Her own name was VanEnkhuizen, and that sounded very dignified too. She used to think that there must have been a baron or count from the city of Enkhuizen. She thought perhaps they were distant relatives of him and still had a little noble blood in them. However, there was not much of it to be seen anymore, for Father was only an ordinary carpenter! Margreet gazed dreamily out of the window. Imagine if you were living in a castle or on a big estate. Then if you looked out of one of the windows of your room, you could see far off into the distance over the forests and estates that belonged to the castle. And, of course, there would be a large lake where you could boat in the summer and skate in the winter. Rianne snuffled a couple of times yet. Willie was nowhere to be found since she was feeling a little bit guilty. “Tell me a ‘tory’?” asked Rianne, as soon as she looked presentable again. Once when the two little sisters were upset because they could not go along with Father and Mother, Margreet had made up a really long, absurd story. Apparently it had appealed to them, and now they often asked for another one whenever the occasion arose. “This evening, when you go to bed,” promised Margreet. “I don’t have very much homework anyway, but now I want to set the table for Mom. Papa is coming home soon, and then we must eat. Will you help me? You may put the forks and spoons on the table. You’re good at that already.” Rianne immediately forgot her troubles and helped Margreet. They all sat together around the table. Father, tired from a long day, didn’t say much. He savored the taste of the cauliflower and scraped his plate clean. Margreet was a bit annoyed. I have a good father and a sweet mother, but they are so plain! The pans are set on the table because it saves on washing, and everyone’s dish has to be scraped clean because later dessert would be served on it. Mother is sitting at the table with her work apron on, and Father still has sawdust in his hair. It could really be a little different. Whenever I have eaten at Tineke’s house it was also very plain, and yet it was more... well... how would you say it?... more refined. Yes, that was the right word for it. She nodded to herself. “How does it taste, Margreet?” asked Mother, who saw her looking so dreamy. “Delicious, Mom,” she said quickly as she felt her cheeks turn bright red. Oh, good thing Mother can’t read my thoughts! She really is dear, always going out of the way for others. No, I shouldn’t be so critical! Those outward things don’t really matter. “How was Knopie?” Margreet asked Jan quickly. Jan nodded. “Oh, yes. There are such beautiful pictures on the walls too. I think he’s pretty nice,” he finished, not sounding so very convinced. Margreet didn’t say any more, but she saw Wim’s mischievous grin. She had also been in “Knopie’s” class herself and had, on occasion, had to do some writing for a punishment. I’m not always so easy to get along with either, she thought truthfully. Jan is so easy going. He will probably get along with “Knopie” just fine. “He started all over again,” answered Jan.
“Good, then let’s reverently read about that too,” said Father. “In the beginning God created the heaven and the earth...” Margreet listened to the familiar words. Some people will not believe this anymore... The teachers at school had explained it often--the evolution theory--what it consisted of, why almost everyone believed in it, and in contrast, the simple creation story. They had explained it so clearly that a person didn’t need to question it anymore. “The last word, Willie?” Father asked. Oh! She had been sitting there dreaming and had not heard anything of the rest of the chapter. Now she listened to the familiar words of Father’s prayer. Now to help clear the table. Whose turn is it this week to dry the dishes? Mother always washed. “The dishes from a warm meal are always so greasy,” she would say if Margreet offered to do the job. “I would rather do them myself. Then at least I know that the pans are good and clean.” It was Willie’s turn to dry. “Shall I get Rianne ready for bed then, Mom?” Margreet offered. Tired from a busy day, Mother nodded. Rianne was already pulling at the buttons of her dress. “Can do it self,” she stated resolutely. “Of course,” agreed Margreet (but she helped her anyway without her noticing it). “I washed you up a little while ago already. All right, put your nightie on and brush your teeth, then you may play for a while until bedtime”. “Tell a ‘tory’?” No, she hadn’t forgotten. “Come on then, we’ll go sit on your bed.” With Rianne snuggled up close, Margreet related a long story about a lost dog. Everything went wrong, and he couldn’t find his little master. Of course, it had to have a good ending, so finally he came back to his master. Rianne sighed in relief. “What an imagination!” came a voice from behind the door. “Eavesdropper!” Margreet scolded. “I didn’t know these stories were still at your level.” She heard Wim chuckle. “Run along now,” urged Margreet impatiently. She blushed. Wim always had such unexpected comments. Yet, in her heart she liked the idea. She had even thought about it herself before. She had a vivid imagination and had received good grades in elementary school for composing stories. “Tell a ‘tory’,” Rianne squeezed her arm and Margreet jumped. In her room Margreet laid her assignment book on the table with a solemn gesture. The first day... now the work would begin!